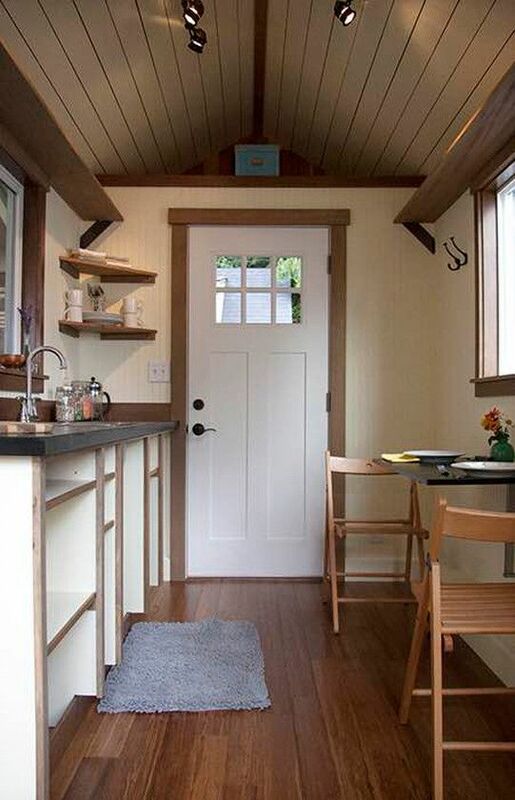 Delve into the depths of Bothell, Washington, to encounter a minimalist tiny living treasure. The Tina-Too has just been completed, and we believe all tiny house enthusiasts will appreciate the workmanship that went into its construction. 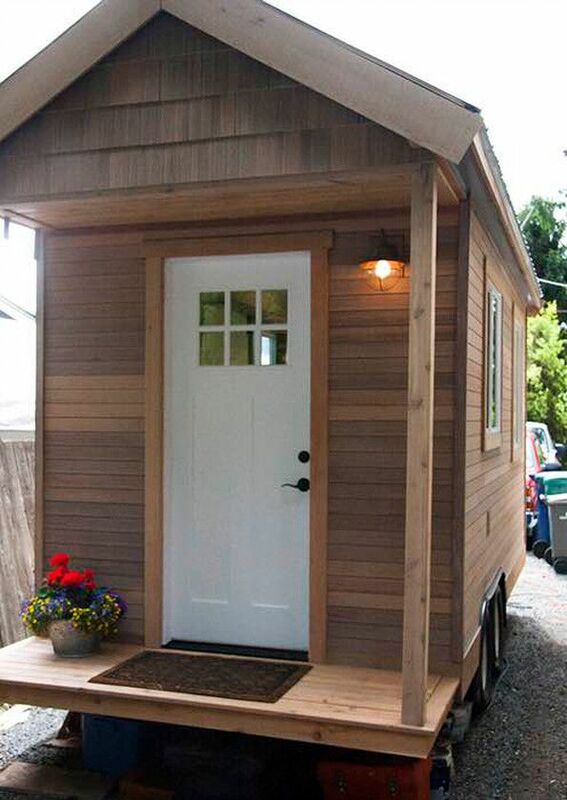 Built by David Wymer from Tina Tiny Homes, this custom-made wheeled abode is on sale and ready to go. Designed to be the ideal camping cabin or mobile office space, this is a tiny house on wheels that prioritizes aesthetics and comfort. But why tell you this, when we can show you? Come with us to explore this lovely little cabin to find out more about its functional facilities. Measuring just 98 square feet (9.1-square-meters) in area, the Tina-Too is a compact labor of love that boasts the finest reclaimed materials and the highest quality workmanship, as the builders themselves describe it on their website. In this picture, we see a white craftsman solid core door that can easily be painted over if a different color suits your fancy. The deck and the rest of the exteriors are lined with fully flashed and sealed cedar trimming. Here is a closer look at the sleek cedar siding. Low-emission windows with screens and rain-screen barriers within the cladding enhance the Tina-Too's ability to endure some of the harshest weather conditions, while full insulation makes the whole cabin nice and cozy in the coldest days. Isn't the inside adorable? The Tina-Too is very much like a full-size dollhouse with the added benefit of practicality. The interiors are made with a mixture of clear vertical grid fir trim and clear maple trim, and the floor is solid bamboo. You will notice the kitchen on one side of the Tina-Too and the dining table on the other. Let's look at each area in more detail. 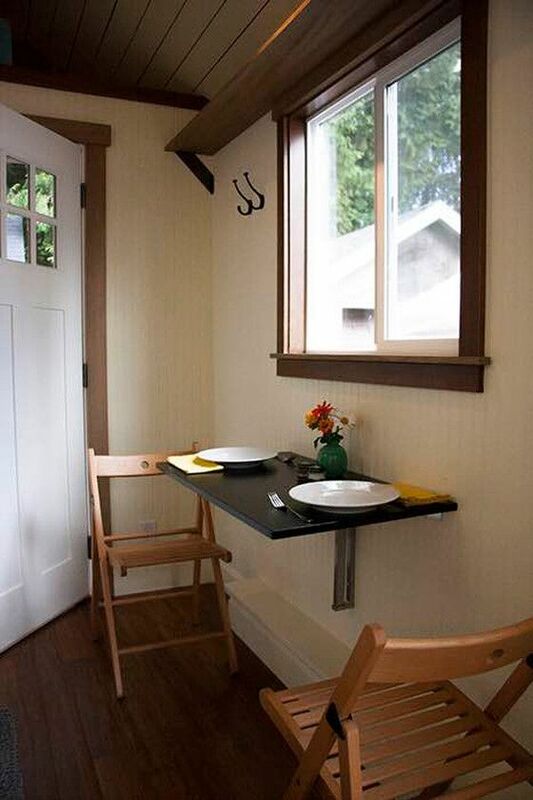 As you can see, this sturdy foldout table can be used as your own intimate dining space. Or it could be used as a desk if you are seeking a compact workstation - if you look closely, there is an outlet just by the door that you could plug your laptop into. Feast your eyes on the kitchen area now. 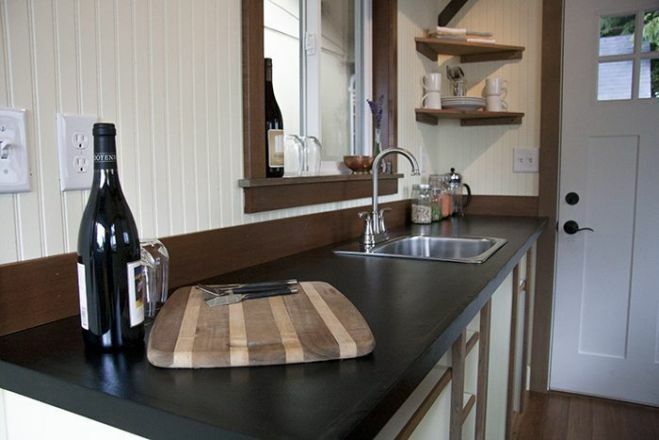 The Tina-Too kitchen has a custom counter top, a stainless steel sink, and ample storage space. The cabinets have been designed to be spacious enough accommodate a refrigerator, a microwave, a portable stove and a water heater. 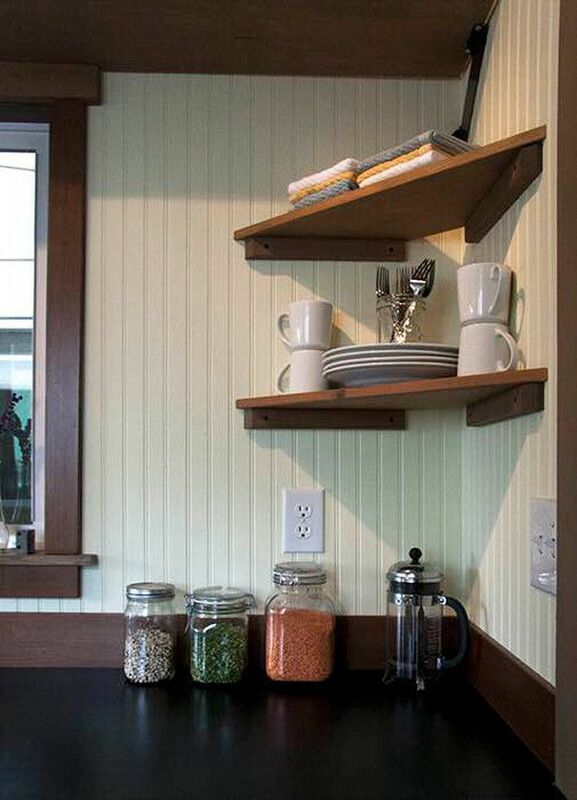 In this picture, the lined-up mason jars show that it doesn't take much to really spice up a kitchen. Consistently showing that minimalist details can enhance any living space, this functional kitchen is comprised of strategically-placed power outlets, as well as additional shelving for plates, cutlery and other utensils. Our final stop is the living room. Here we have a slide-out sofa bed for extra comfort, and two lighting sconces on each side of the window to enhance the luminosity of the Tina-Too interiors. 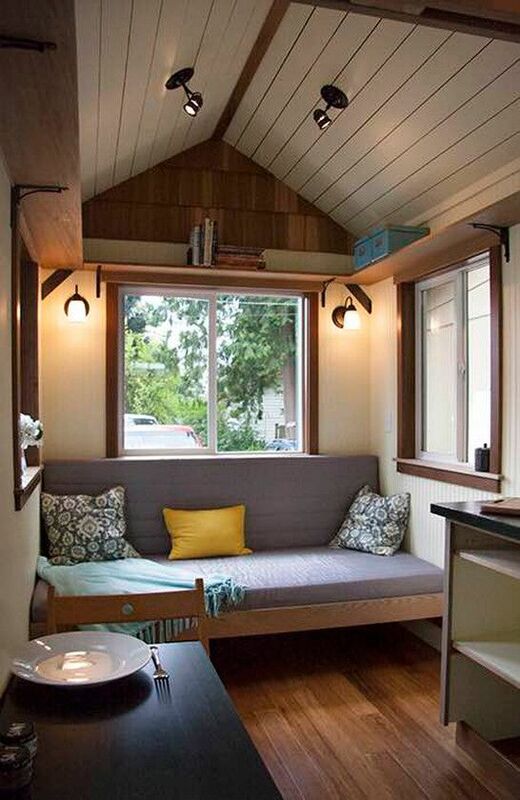 Looking at everything from this angle, we get a proper feel for this tiny abode's open-plan design. A cathedral ceiling, overhead lights, and mounted shelves give the Tina-Too the final touches in the pursuit of practicality, comfort and flawless composition. The downside is that the Tina-Too, from what we can tell, seems to be lacking bathroom facilities. But for a basic glamping getaway or an added working space not too far away from home, the Tina-Too is well-placed to sate the appetite of all tiny living enthusiasts. This is a marvelous little cabin that we know wouldn't have been the same without the love and attention to detail that went into it. All it needs is a few personalized touches from a tenant who is ready to enjoy its efficient amenities. 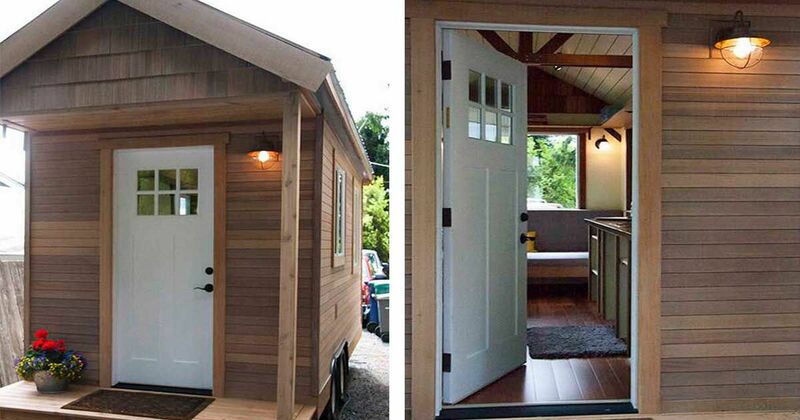 This is a sturdy, gem of a tiny house, built with 2x4s, so that it will accommodate full sized appliances. How smart is that?